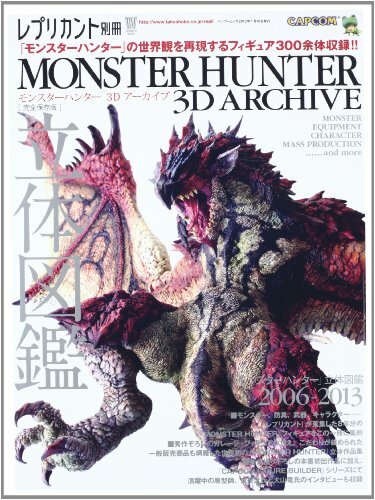 Monster Hunter 3D Archive is a wonderful collection of over 300 pictures of Monster Hunter (モンスターハンタ) merchandise figures. The collection of figures are from 2006 to 2013. The book's a paperback of 128 pages. Chapters are on the monsters, equipment, characters and interviews. The monster designs are amazing. Sculpted versions certainly feel more real, more so than 3D model renders. The photographs are in high resolution and all the fine details and textures can be seen and almost felt. Some of the painstakingly sculpted ones are the limited editions. The equipment section looks at the heavily armoured characters with their wickedly huge swords. Monster Hunter series compared to other games probably have some of the crazier armour and weapon designs. I love the sword designs, especially those that have scales and even thorns on them. The next section on characters are actually those characters that aren't heavily armoured. You have the cats, pigs and some chibi figurines. Interviews are with Takayuki Higashi (東誉之) and Ryu Ooyama (大山竜). Finally, there's the mass production section that looks at all those scaled down Monster Hunter figures. These are the ones you can probably find selling online. There are several sets, chibi variations of characters and monsters, and other merchandise figures sold with game releases. It's a great book for any Monster Hunter fan. There's a huge variety of figures to look at. Also included are information like release dates and their prices.